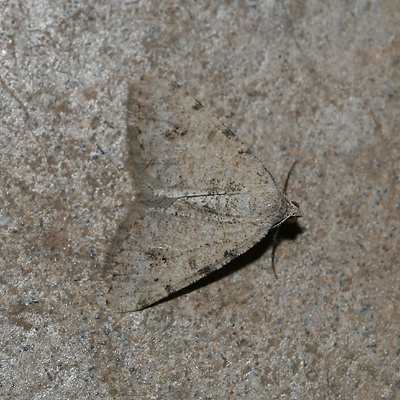 To hide from sharp-eyed predators like birds, many moths have cryptic coloration (camouflage) which makes them difficult to see against a particular background. While many moths have the color and patterns of tree bark, this moth was an almost perfect match for its chosen background of a cement patio. This moth's cryptic coloration protects it from birds, but not from human feet. 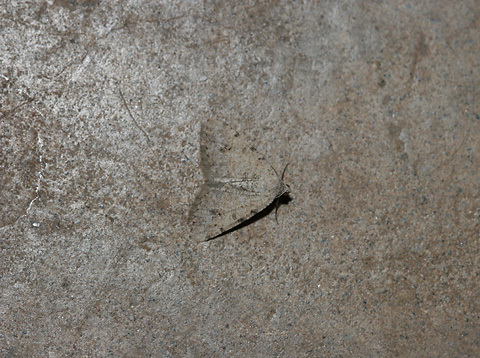 This moth was so hard to see that I almost stepped on it. My bare foot was already on the way down when I luckily noticed the camouflaged moth and took a hasty giant step to avoid squishing it. Without the harsh, dark shadow cast by my camera's flash in these photos, this moth was almost invisible when seen in natural light. Fortunately for this little moth, I usually look at the ground when I'm walking outside because there are so many things to avoid stepping on here in the Sonoran Desert, such as rattlesnakes, scorpions, and wickedly spiny pieces of cholla cacti.